I’ve mentioned before that the owl was a symbol of my sorority. And back 10+ years ago, owls weren’t cool. But now they are chic…reallll chic according to my latest installment of beaHOOTiful owl apparel. I mean, some of these are so adorable, whooo gives a hoot about the price ; ) When you have a piece of cute owl apparel, everything is going to be owlright. Haha love all your owl lingo - what a hoot! 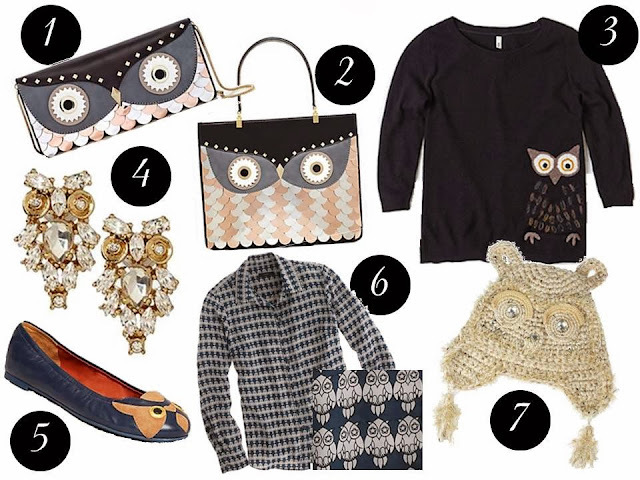 I have always, always, always loved owls and am so happy that they are actually "on trend" now! I have my classroom decorated in owls and everyone asks if I've always liked them and the answer is NO! Haha... The owls of yesteryear were those ugly statues that were in the sorority house that everyone hid in Harb's bed to scare the crap out of her! Now they are everywhere and so freaking cute! I might just have to buy something off of this owl list!